An outdoor recreation party is simple to plan and can provide the backdrop for virtually any type of celebration. 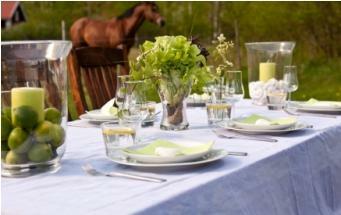 An outdoor party can commemorate a special holiday, like the 4th of July or Memorial Day, a birthday, or an anniversary. In fact, you really don't need an excuse to host a party in the great outdoors. Whether you have a special occasion in mind or you simply want to get together with family and friends, an outdoor party is easy to plan and just as simple to host. The time of the party is really contingent on what would be the most convenient for the majority of your guests. Since you can't please everyone, choose a date that works around your schedule as well as any of the other hosts. Part of planning the time may rest on when you can reserve a certain location, such as a park pavilion. If you don't want to worry about reserving a place, then consider hosting the party at your house or a friend's. Better yet, if the celebration is a neighborhood affair, then turn it into a block party. Before you block off roadways to through traffic, however, check with your local government to see if there are any restrictions for hosting this type of party. Whatever location you choose, be sure it will accommodate all your guests. An outdoor recreation party usually centers around food and drinks. Planning a menu can take a lot of work - if you try to do it all on your own. Instead, make meal planning a cooperative effort and include several others in the food preparation. Another idea is to make the party a potluck affair, and invite everyone to bring his or her favorite dish. Either way, you'll probably need to be responsible for bringing plenty of drinks. A simple solution is to set out several 2-liter drinks and jugs of iced tea, or you could make a simple punch of ginger ale and lemon-lime soda, throw in some lemon slices and ice, and have a delicious and refreshing drink. If alcoholic drinks are on the menu, ice down a variety of beers, or set up a bar with sodas and a variety of liquors so guests can be their own bartender. If you take this route, be sure you have plenty of options for those who don't choose to imbibe as well. The location of your outdoor recreation party may dictate whether or not you can add decorations to the area. If it is possible to decorate, however, consider placing citronella candles on all the tables. They will illuminate the night (if you're hosting an evening gathering), and they'll help keep away those unwanted mosquitoes. You can also string white lights around trees and bushes, and fill white paper sacks with sand and small votive candles, a great option for walkways and steep paths. Your outdoor celebration certainly doesn't have to include a theme, but sometimes a theme makes the organization of the party a little simpler. Some popular outdoor themes include luaus and Mexican fiestas. Of course, parties that commemorate special occasions are themes in themselves, and you can decorate these with balloons, flowers, streamers, and more. If your budget can afford it, consider hiring a band. Guests can tap their feet and even dance the night away if they choose. If children will be present, invest in some inexpensive beach balls, set up a volleyball or badminton net, and host some fun competitions, like sack races, a three-legged race, and even a kickball or softball game. Consider the following tips and advice to ensure your party is a success. Keep foods cold or hot, accordingly. You don't want your guest to go home with food poisoning! Spray the area for bugs before the party starts. Then, keep citronella candles and torches burning throughout the party. However, keep these away from small hands. Make sure plenty of drinks and ice are available. You don't want guests to become dehydrated. Set up lots of visible garbage cans, so guests will clean up after themselves. Choose an area that provides at least some shade. Be sure there is ample seating on hand, even if that means throwing a few blankets on the ground. Bring along some sunscreen and extra bug spray for those guests that may need either or both items. Finally, remember the weather doesn't always cooperate, so have an alternate location or party date in place in case things go awry.